Volume 4 of this incredible series begins with letters following the birth of Emily Frances Judson. Emily and Adoniram Judson had been away from the United States for eighteen months, and had been in Burma (Myanmar) for about a year. These letters reflect correspondence between home, family, and friends; they also reflect the life within the missionary society in Burma with letters between the missionaries. The letters of 1849 show serious health issues for both Emily and Adoniram, and towards the end of the year we find the correspondence detailing his final illness, his departure for a sea voyage on April 3, 1850, and the conclusion of his life on April 12, 1850. 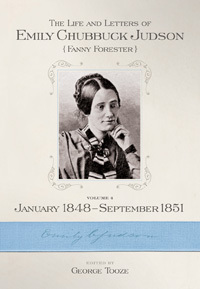 Emily was not to learn of his death until August 1850, and there are a number of hopeful letters written to Adoniram by Emily, not knowing of his earlier death. The volume has numerous letters of grief and condolence, Emily’s determination to remain in Burma to continue Judson’s work, and her final acceptance that returning to the United States and taking care of the Judson children would be what Adoniram wanted her to do. Then the letters follow Emily Judson’s return to the United States (She arrived the last day of September 1851.) accompanied by her daughter Emily Frances, and the youngest two sons of Sarah and Adoniram Judson, Henry and Edward.